Figure A92. Welford anomaly, interpreted as the Welford slab, with (horizontal) [vertical] cross sections through (A)[D] the UUP07 p-wave) and (B)[D] the combined SL2013 and S40RTS s-wave models at 430 km; C) the location of the modern geological record that we interpret to have formed during the subduction of the slab. 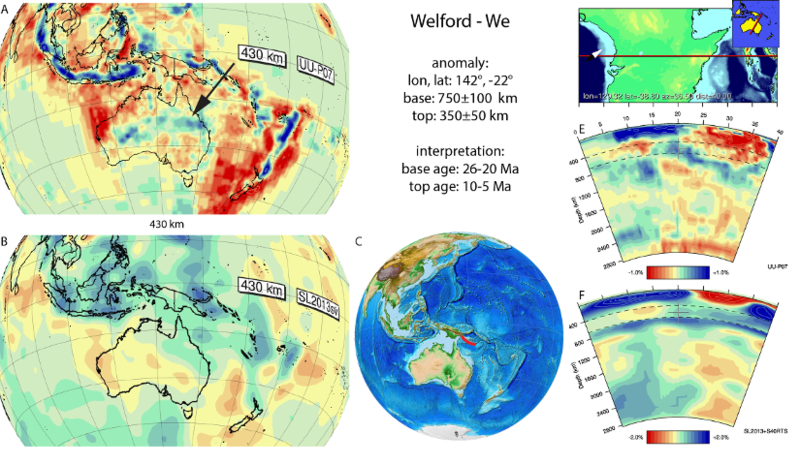 The Welford anomaly (Figure A92) corresponds to the southwestern part of the A7 anomaly of Hall and Spakman (2002; 2004) and underlies NE Australia, flat-lying at the top of the lower and base of the upper mantle. Hall and Spakman (2002; 2004) note that their A7 anomaly is not everywhere well-defined and may in fact represent more than one slab, whereby the northern part of the slab below NW Australia (the Papua anomaly) may be disconnected from the southwestern parts of the anomaly, which is the interpretation we follow here. Kinematic reconstructions of the region NE of Australia consistently interpret a southwestward Trobriand subduction zone to form as far-field response to collision of the Ontong Java plateau with the Melanesian arc at 26-20 Ma (Hall, 2002; Quarles van Ufford and Cloos, 2005; Knesel et al., 2008). This trench would have been active until ~10 Ma, after which northward subduction of the New Britain slab created the Bismarck arc since 10-5 Ma (Hall, 2002; Holm et al., 2013), accommodating northward absolute plate motion of Australia.